I’m beginning to think I bought all these art supplies for myself….I probably use just as much as the stuff as the kids do! Why not? It’s raining out, I had three episodes of Dr. Phil to catch up on and all three boys (yes, three. My friend’s two year old joins us 1-3 days a week) were passed out during nap time. I googled “paper pumpkin” and this project was the second image that came up. It’s from The Hostess with the Mostess. 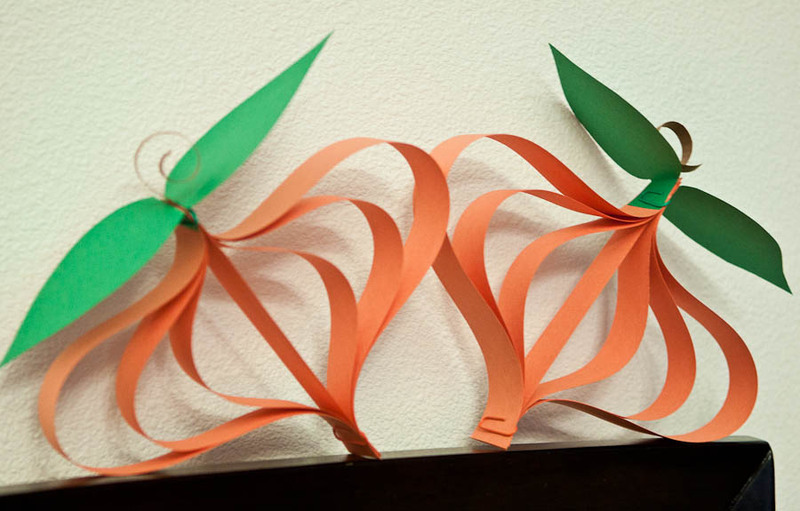 You just need orange, green and brown construction paper (check), scissors (check) and paperclips (check) or stapler (check). It took about 5 minutes to make each of them but it would have been A LOT faster if I had a paper cutter…hmmm…I do have a 40% off coupon for Joanns that expires tomorrow…hmmm…okay, sorry. Anyway, I wanted to hang them but I figured putting two new holes in the wall today was enough so I propped them on top of this huge gold mirror we have in our living room. Maybe I will get one of those 3M hooks to dangle them all from. Anyway, I haven’t done a craft in a long time! Fun and easy! I suggest using the paperclips (happened to have colored ones as well to match) because you’d be putting 3-4 staples at the top because you need to keep adding the stem and leaves.